The website ‘Rome Travel’ describes Rome as a ‘modern and interesting city’. Well, that could just be the understatement of the year! Of course it’s interesting! Far more than that, it’s amazing. Rome is one big historic (open-air) museum and with so much to see you always experience a lack of time. The fun thing about this museum is that you can reach all major attractions by foot. If you stay somewhere in Rome central, just walk and experience the history. 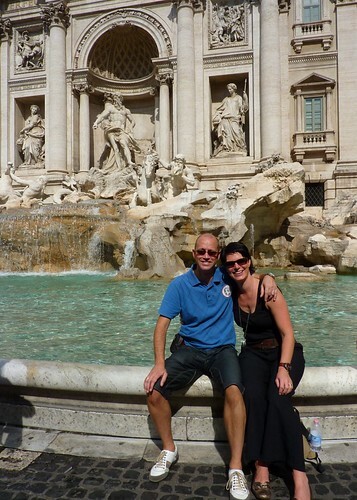 In 2009 we stayed in a beautiful apartment close to the Spanish steps. From that area we went by foot walking to the Vatican, the Colosseum and all other major attractions. By walking the city you know what I mean when I state that in Rome history looks at you around every corner. By showing you particular photographs, this post explains how I think of Rome being one big historic museum. The history, the buildings, the people, they all seem to blend in to become one great experience. Walking down a street, looking up as you come around the next corner and again be amazed by great architecture or just the Roman way of living. The best dinner we had was on the first evening, when we strolled the historic streets close to the Spanish steps. We found this small restaurant with terrace outside, almost in the middle of this narrow street. A pizza and a glass of red wine, listening to the sounds of the city and the echoes bouncing between the buildings. It was amazing. The diversity of Rome comes in many forms. What about throwing coins over your shoulder in the Trevi fountain, standing in line at St. Peter’s square in Vatican city, eating pizza at Piazza del Colloseo, watching nuns from all over the world carrying their suitcases across the streets, drinking an espresso in Da Luigi Trattoria, gazing at the hole in the ceiling of the Pantheon, well, you get my point. And, I almost forgot, what about the fashion designers shops, even the Ferrari store? Modern shopping, but well embedded in historic architecture. Do you also think Rome is just interesting? If all roads lead to Rome (even yours one day, I am sure), how could this city be just interesting? Take at least 3 days, put on your walking shoes and off you go! Experience various districts and enjoy the major sight seeing spots. But please don’t forget one thing: when you come around the next corner, stand still for a moment, look up and look around. Be amazed, history repeats. If you like to read more blog posts on Rome, please visit Prolific Living’s “Pantheon in Rome” and VelvetEscape’s “Places that inspire: Rome”. Rome certainly is a wonderful place to wander around. The Pantheon is my favourite place. I go there each time I visit Rome. It was under scaffolding when I was the in November. Hopefully it will be looking shiny and clean when I go back next year. I took some great photos of Bernini’s fountain in Piazza Navona http://bagnidilucca.wordpress.com Thanks for the lovely tour of Rome. Thanks Danny. You are ahead of me by 1 trip 🙂 I’m sure I will visit Rome again, once is not enough. I agree wholeheartedly that Rome is a huge museum. It’s amazing that city officials cannot even extend the subway lines because they keep finding ancient ruins. I’m saddened when I meet other travelers who didn’t like Rome for some reason, too busy, too dirty, whatever. I fell in love with it. One of my favorite destinations ever. Thanks so much for your compliment, it means a lot to me. Especially from a woman who has seen a lot of the world and is so curious to learn about other cultures and behavior. I love your blog as well and I will make sure to follow it! And yes, how can you better discover another culture than to become part of it….you as a geisha in Japan is a great story. Nice to meet you and stay safe all the way out there in Okinawa! Ah, Roma!! I have plans to visit its streets again in just under two years with my daughter. Rome is one of a kind. There are other cities that have the history but here is something about Rome that sets it apart. It as if the city serves as a bridge that allows people to occupy a space in between the past and the present. I am sure that this has something to do with my love for most everything Italian, but standing in the Coliseum or walking down the narrow streets – sometimes I feel as if I am not exactly in the 21st century but caught somewhere in between. Wonderful way of describing Rome, thanks so much for your comment. Rome is about being caught in history, for real. I’m always very happy with your replies, thanks so much! Rome is not to be compared indeed. Good to know you adore the magic of Italy so much! You know I don’t like to write posts that sum up a list of sightseeing spots. I try to focus on how I experience a city or country. There is not another city in the world like Rome….There are cities I love, cities I adore, cities I like and cities I’d return to but no city like Roma! I LOVED Rome – I loved all of Italia! I can’t wait to return. The magic of Italy is untouched by the passage of decades and even centuries. So nice of you to write a post here about a fantastic city AND so kind of you to link back to my post, Emiel! Maybe some day we meet up in Rome and have a dinner with our spouses at that restaurant you mention? You never know!! !